Have you ever been in a meeting and thought to yourself, “I wish my coworker or boss could hear themselves talk? Or better yet, see how they act when faced with a tough situation?” We sure have! In fact, there have been times when we’ve literally been silently screaming in our heads, “Stop, please just stop.” Sadly, at that point, the damage is done. And, as leaders, we know better than to call someone out when they’re acting like a blubbering baby or, worse, a raging lunatic in a meeting. So why do some people seem to take things in stride, while others come apart at the seams? It all boils down to their level of emotional intelligence, or EI. Before we get to the textbook definition of emotional intelligence, take a minute to think about what it means to you. Is it simply being aware of how you feel at a particular moment? Is it about controlling your emotions in a stressful or uncertain situation? What about controlling the emotions of others? Is it that, too? And is it something you’re born with or is it something you learn through practice? What if we told you it’s all these things? 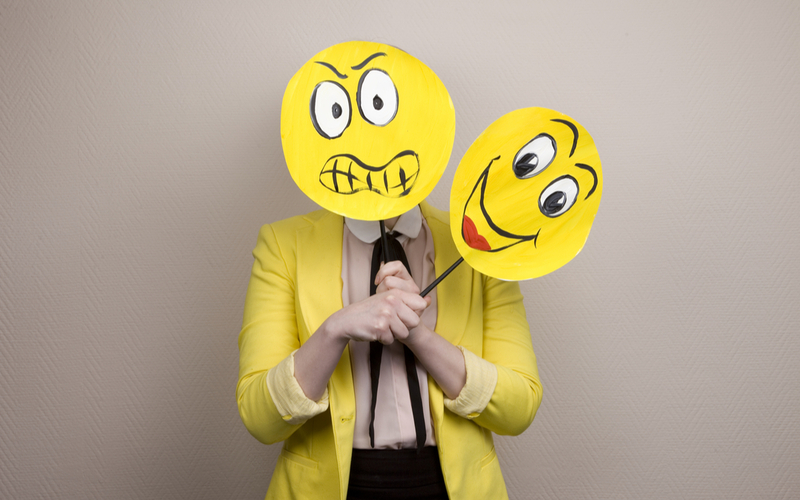 When you’re emotionally intelligent, you can identify and manage your own emotions, as well as the emotions of others. Most experts agree it’s generally comprised of the following three skills. Now, these skills may come more naturally to some people. But the truth remains that we all must practice being more emotionally intelligent if we want to succeed in business. And we must learn how to apply our EI to how we communicate with—and respond to—those on our team. As leaders, we probably all face situations every day where we need to flex our EI muscle. Yet, for most of us, whatever scenario we’re dealing with doesn’t end up being recorded on someone’s smartphone. This was the case recently for superstar singer Céline Dion. Thanks to YouTube, you probably saw the video. What we thought was remarkable was Céline’s poise in dealing with a reportedly intoxicated fan who somehow managed to get onstage in the middle of the singer’s concert. Keep in mind who we’re talking about here. It’s Céline Dion. You know, one of the best-selling artists of all time and one of pop’s most influential voices. She’s won five Grammy Awards and is recognized as the second best-selling female artist in the US during the Neilson SoundScan era. In all honesty, she has enough clout that she could have easily turned her back on the woman, stomped off stage and never finished her performance. In fact, someone without the same level of emotional intelligence might have done exactly that. Indeed, the list of famous singers, actors and comedians who have stormed off stage after being offended is long! And even though some on the list may have returned to the stage, their reputation still took a hit. So, what makes the situation with Céline stand out? And why does her reaction make for a great business lesson? It’s a good example of the influence that emotional intelligence can have on how we communicate in any given situation. It’s in the small details. Like how she not only managed her own emotions, but also those of the woman and the crowd. Céline was obviously shocked and likely a little fearful. Yet, she didn’t waver. Instead, she remained cool, calm and collected. She spoke to the woman in a low, comforting tone. She smiled at her and even helped her as she made her way offstage. And then she took a few minutes to talk to the crowd about what had just happened. In the end, Céline was kind, empathetic and, most importantly, in control. It’s a far cry from what could have happened, right? Céline could have freaked out, screamed for her security guards and had them forcibly remove the woman from the venue. But that didn’t happen. To us, that’s a clear indicator of someone who understands the power of emotional intelligence. Being able to harness and direct your emotions in a similar way is becoming increasingly important in the business world. In fact, according to the World Economic Forum, emotional intelligence is on track to become one of the top 10 desired job skills by 2020. And Forbes just published this article that highlighted the results of an international study that showed 78 percent of leaders said personality is what sets exceptional employees apart. What’s interesting was that the author of the article was quick to point out that “personality” is often the code word for emotional intelligence. Because of this trend, we often find ourselves counseling executives on how to enhance their emotional intelligence and other leadership qualities as part of our leadership development work. Although it’s a pretty deep topic, here are a handful of smart tips to help you get started on strengthening your emotional intelligence. There are many different factors to consider when thinking about your emotional intelligence. Sometimes we just have an “off” day and we may react poorly to a situation. If this happens—and it’s uncharacteristic of you—then there’s probably little harm. But if it becomes an everyday kind of thing, then you have a bigger problem. It’s the difference between having a bad mood and a bad attitude. A bad mood is temporary. It’s a state or quality of feeling at any given time. A bad attitude is quite different. Your attitude is what or how you think about a situation. Here’s an example. You just got into a heated argument with your boss—and you’re frustrated and angry. That’s your mood talking to you. Now, instead of stewing about it, you choose to think about ways you can make everyone’s workload a little easier. This is all about your attitude. Your attitude—whether positive or negative—not only affects you and your boss, but it can also spill over into others on your team. Can you see now how this all ties into emotional intelligence? To build your EI muscle, start by practicing one, two or all ten of these tips. Some are more inward-focused, while others are more outward-focused. First, you need to take a long, hard look in the mirror. But be warned: This will likely be the hardest step to take. Developing a good sense of self-awareness is crucial to strengthening your EI muscle. Start by being consciously aware of how you feel throughout the day and particularly in certain situations. You may need to set aside purposeful time for these assessments. Next, take note of how you react to the way you feel. Pay attention to your specific behaviors. Are you boiling inside every time you walk into a meeting with a particular person? Do you find yourself rolling your eyes at your coworker’s drama of the day? Do you get defensive every time someone asks you a question about a project? Think about what would make you feel better in these situations and react differently. Keeping a journal of your emotions and reactions can help you objectively review where you are today, and help you make incremental changes for the future. Most importantly, make sure you take responsibility for your feelings. Sometimes it’s hard to objectively question ourselves. This is where a trusted friend or adviser can help. We encourage you to tap into someone in your network who can provide you with valuable feedback regarding your level of EI. Before you ask someone for help, though, make sure you’re ready to hear the good, bad and ugly. And be sure to set up ground rules for how you’d like to receive feedback. For one idea, check out the FeedForward exercise that we learned from Dr. Marshall Goldsmith at the 2017 Ultimate Culture Conference. Related to the above, we encourage all our clients to be open-minded and accept constructive criticism. When handled appropriately, criticism can be a doorway to success. One of our favorite quotes attributed to the famous philosopher Aristotle is, “Avoid criticism by doing nothing, saying nothing and being nothing.” We don’t know about you, but we want to be a whole lot more than nothing. So we say, bring on the criticism! As you take in others’ critiques, be sure to balance them against your own gut feelings. Sometimes the feedback we receive from others is valid. Other times it could be somewhat skewed. Take a minute to introspectively look at the situation. And then check it against what you know about the person, the situation and yourself to decide whether your emotions and subsequent actions were justified or could have used a little more polish. The most important part of this is making sure you’re being objective and honest with yourself. When done routinely and appropriately, this self-awareness check can pay great dividends. Life’s like a box of chocolates. You never know what you’re going to get. Sometimes it’ll be good. Sometimes not so much. Like those with nougat, yuck! Learning how to overcome negative thoughts in those not-so-great moments is crucial to building your emotional intelligence muscle. One of the most common pitfalls we see our fear of rejection. Let’s face it, being rejected is rough. It’s an inherent fear in all of us. It could be a girlfriend who’s not returning a text. Or a boss who turns his nose up at your idea. Or that dream job that just slipped through your hands. The situation itself doesn’t really matter. What matters is how you handle it. You can be more prepared by creating more than one option upfront (i.e., plan A vs. plan B) and thinking positively about what you’d like to see happen in the future. The practice of thinking “as-if” you’ve already achieved something can be powerful in not letting negative thoughts overwhelm you. Go ahead, give it a shot! Setting boundaries can be just as hard as objectively evaluating your own emotions. Some people find it particularly difficult to say “no” to others. When they do, they feel like they’re letting someone down, or they’re somehow weak. We couldn’t disagree more. In fact, we believe healthy boundaries are a crucial element in building emotional intelligence. In business, you must teach people how to treat you. Otherwise, they’ll treat you in whatever way they think is appropriate. But you—and only you—can set the tone for what you find acceptable from your peers and superiors. Now, this doesn’t give you a license to be unfair or nasty to your co-workers. And we still encourage you to be flexible and nimble, and compromise whenever you can. This is another tough one for a lot of folks. We all have our moments where we just can’t wait to jump in and give our two cents. In casual conversations between friends this likely isn’t a major issue. But it can become a big barrier in business. Those who are emotionally intelligent often listen intently first and speak only after they better understand the bigger picture. And they’re much more likely to let the other person state their position without passing judgment. Speaking of judgment, being overly critical is a tale-tell sign that you lack a high level of emotional intelligence. Usually this is a result of our insecurities. Ever stop to think that maybe the things we see in others that we don’t like are some of the same things we dislike about ourselves or our own work? It’s true. So, the next time you’re tempted to toss someone’s idea out the window, force yourself to stop. Flex your EI muscle and listen to the conversation. If, after you’ve heard the full story, you still think it’s a bad idea, find ways to initiate further dialogue. This is about allowing people to take risks and embracing failure in business. For more information, be sure to check out our recent blogpost on why failure can be good for business. Believe us when we say the fastest way to get labeled a “jerk” is to have a knee-jerk reaction to everything. Leaders with a higher level of emotional intelligence show empathy and control in their responses. They take the drama out of situations and explore the “why.” Practice this by putting yourself in the other person’s shoes and think about how you’d want them to respond to you. Think about it from their perspective and don’t make it a personal attack. Now, this isn’t to say that a toxic individual should be allowed to continually derail a project or even a team. Leaders still need to swiftly deal with unacceptable behavior. And yes, this action gives you yet another opportunity to build your EI muscle. And last, but not least, don’t let failure or adversity stop you in your tracks. If you get knocked down, pick yourself up by your bootstraps and move on. Be sure to take a few minutes to analyze what happened, how you felt and reacted at the time, and what you might do differently in the future. If you need a further kick in the pants, check out that failure blogpost mentioned in tip #8 above. When it comes to emotional intelligence, it’s important to remember that your reaction is a choice. Thinking of the Céline Dion example, if your interactions with others were recorded, would you like what you see? If not, then practicing the above tips can help. If you’d like more information on how IronStrike can help with leadership development, including building your EI muscle, call us today!